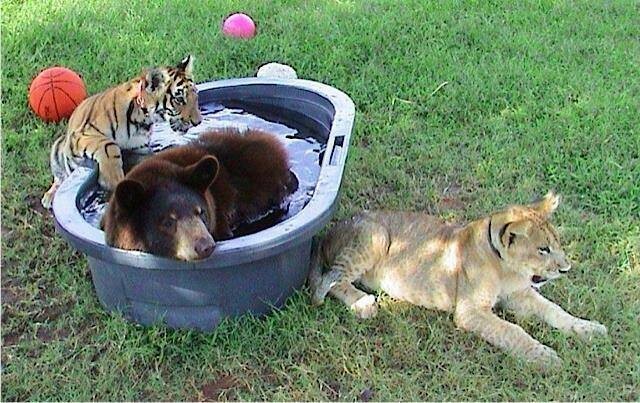 Most animals find themselves gravitating towards their own direct species, but these three brothers? 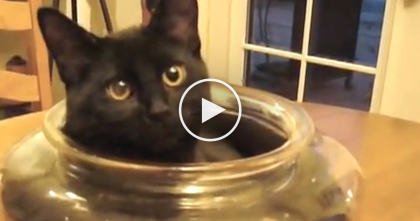 You won’t find that at all, in fact when you see it, you’ll be shocked! 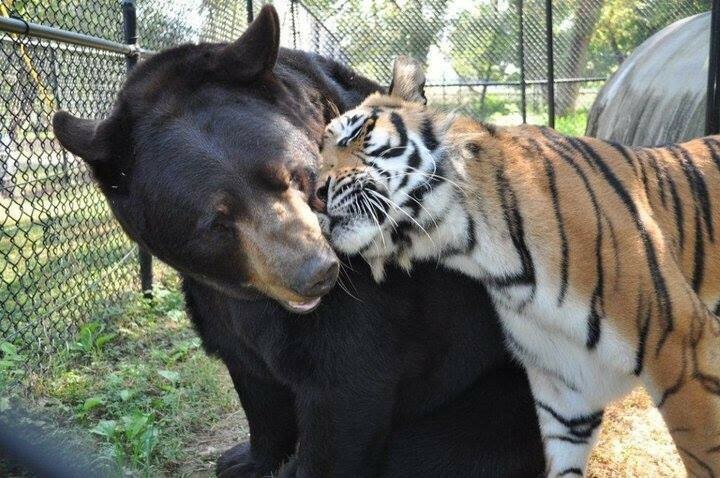 Most people might assume that it’s absurd to expect animals like this to remain friends even though they come from vastly different backgrounds, but it’s true and amazing all at the same time! 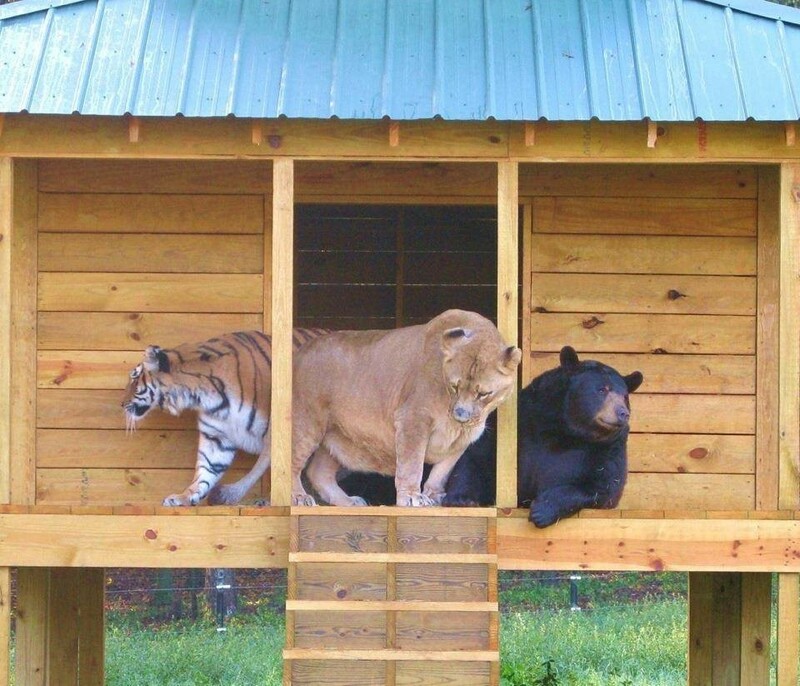 You wouldn’t normally expect this to happen, but at Noah’s Ark Animal Sanctuary in Georgia you’ll see an American black bear, an African lion and a Bengal tiger living in perfect happiness and harmony. 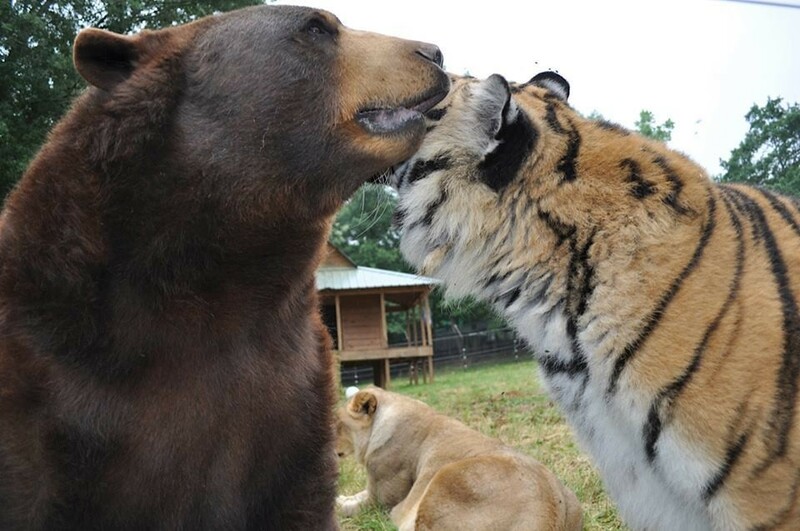 They have been together as brothers completely inseparable for over 15 years. 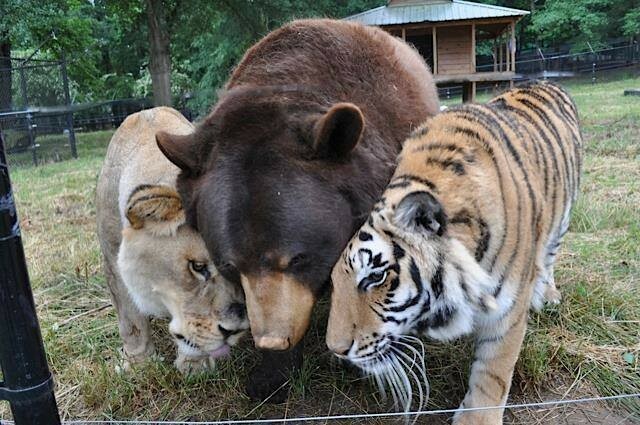 Shere Khan, the tiger; Leo, the lion; and Baloo, the bear were found trapped all together in the basement of a home during a drug raid in Atlanta Georgia. They loved each other from the very beginning as they only had each other to rely on during the harsh early years where they lived in the musty basement trapped and without sunshine. 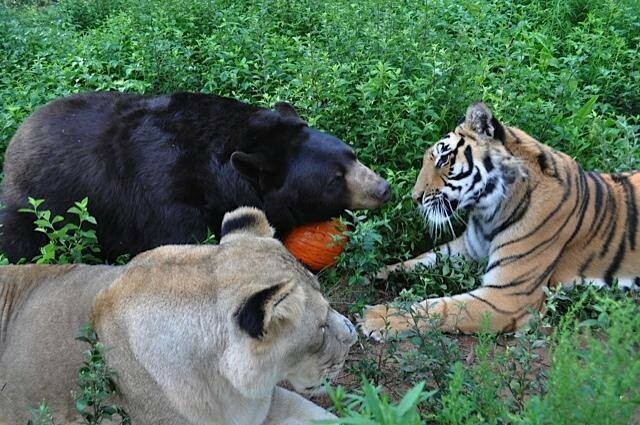 It may be a very sad story, but thankfully the team at NASS helped rescue these big cats and Baloo the bear. Now they live happy lives together as best friends! The reason all 3 get along so well is most likely due to the fact they lived in such horrible conditions during their early years; their only happiness was found in each other. Sadly these three were kept as cubs in a basement until they were brought into the light and rescued by the team at NASS. 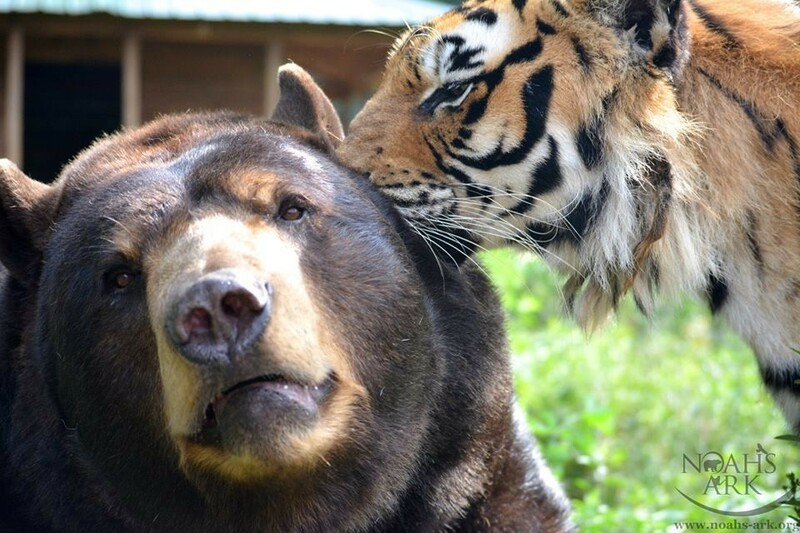 Thankfully they now share love together just like they did as cubs. They’re inseparable brothers and have never left each others side! 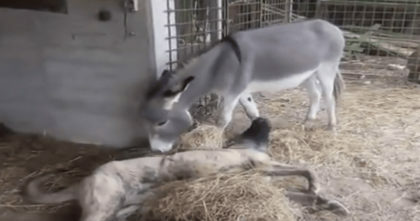 It’s amazing what love can do—SHARE this amazing story with your friends! 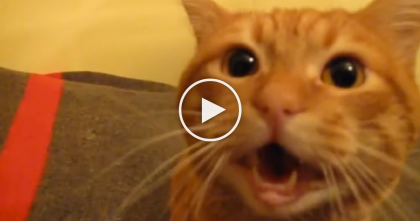 He Came Home, But When This Ginger Kitty Notices?? 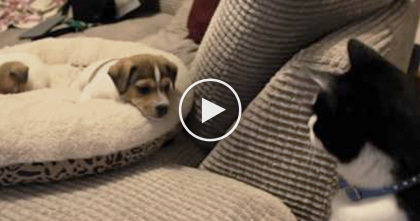 Just Watch The Reaction, Awwwwww! 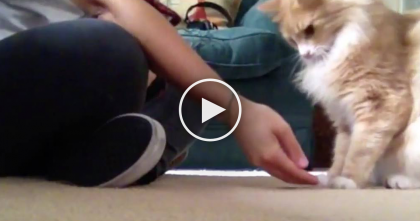 She Started To Teach This Cat Some Tricks, But When I Saw The Results…WOW, Can You Believe It? !